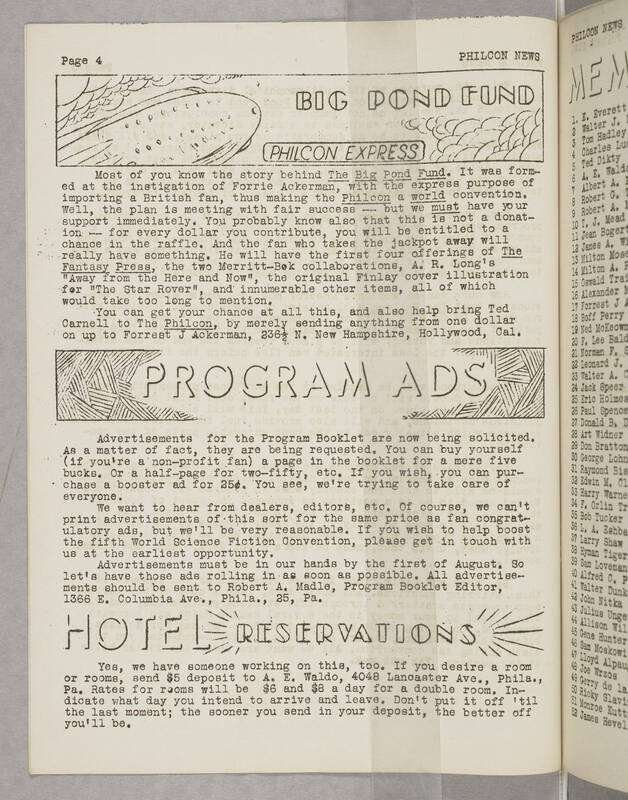 Page 4 PHILCON NEWS BIG POND FUND PHILCON EXPRESS Most of you know the story behind The Big Pond Fund. It was formed at the instigation of Forrie Ackerman, with the express purpose of importing a British fan, thus making the Philcon a world convention. Well, the plan is meeting with fair success — but we must have your support immediately. You probably know also that this is not a donation — for every dollar you contribute, you will be entitled to a chance in the raffle. And the fan who takes the jackpot away will really have something. He will have the first four offerings of The Fantasy Press, the two Merritt-Bok collaborations, A. R. Long's "Away from the Here and Now", the original Finlay cover illustration for "The Star Rover", and innumerable other items, all of which would take too long to mention. You can get your chance at all this, and also help bring Ted Carnell to The Philcon by merely sending anything from one dollar on up to Forrest J Ackerman, 236 1/2 N. New Hampshire, Hollywood, Cal. PROGRAM ADS Advertisements for the Program Booklet are now being solicited. As a matter of fact, they are being requested. You can buy yourself (if you*re a non-profit fan) a page in the booklet for a mere five bucks. Or a half-page for two-fifty, etc. If you wish, you can purchase a booster ad for 25$. You see, we're trying to take care of everyone. We want to hear from dealers, editors, etc. Of course, we can't print advertisements of this sort for the same price as fan congratulatory ads, but we'll be very reasonable. If you wish to help boost the fifth World Science Fiction Convention, please get in touch with us at the earliest opportunity. Advertisements must be in our hands by the first of August. So let's have those ads rolling in as soon as possible. All advertisements should be sent to Robert A. Madle, Program Booklet Editor, 1366 E. Columbia Ave., Phila., 25, Pa. HOTEL RESERVATIONS Yes, we have someone working on this, too. If you desire a room or rooms, send $5 deposit to A. E. Waldo, 4048 Lancaster Ave., Phila, Pa. Rates for rooms will be $6 and $8 a day for a double room. Indicate what day you intend to arrive and leave. Don't put it off 'til the last moment; the sooner you send in your deposit, the better off you'll be.